It provides latest and fastest lottery result in Malaysia. It lets you to find out the live and past result of Magnum, Da Ma Cai (3D, 4D, 6D) and Sports Toto (4D, 5D, 6D, Supreme Toto 6/58, Power Toto 6/55, Mega Toto 6/52) quickly. 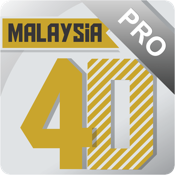 The only 4D mobile apps that allows you to check out all past winning history from all Magnum, Toto and PMP Damacai. It is all-in-one application. Fully support retina display on both iPhone and iPad! Disclaimer: We have made every effort to ensure the accuracy and correctness of the content, information or data contained in this app. However, we do not represent or warrant the truth, accuracy, completeness and correctness of the same. We accept no liability for loss or damage suffered or incurred by you as a result of your reliance on the material in this app or howsoever arising from the use of the information or material presented herein.